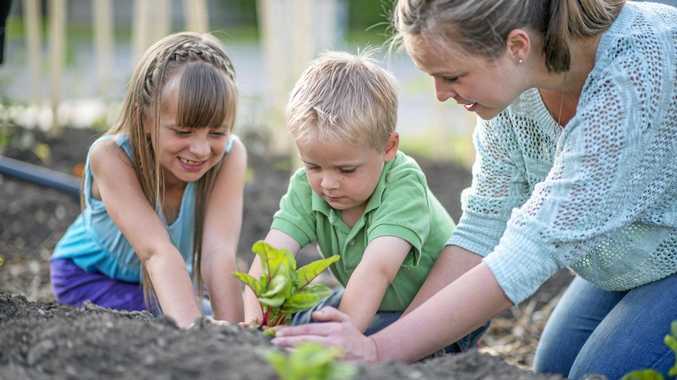 Gardening with kids can be great fun, as well as helping them to appreciate the natural world. There are just a couple of simple rules to follow - keep it fun, keep it simple, keep it safe and give the youngsters plenty of control. Everyone will have a great time. Give the kids their own pot or space in the garden to grow whatever they want. A punnet of flowers or some potted colour is cheap and instant. Just make sure you choose easy-to-grow varieties that are suitable for the position so your child will have success. Use premium potting mix in a pot, and enrich the soil with well composted organic matter for great results in the garden. Plant seeds and watch them grow. Beans, corn and nasturtiums are easy for little hands to manage, and they are pretty reliable, germinating within 7-10 days. They are also yummy to eat right there in the garden, as are cherry tomatoes. If you plant lettuce now, the first young leaves will be ready to pick within a week or so. Involve the youngsters in the decisions about what to plant and where. Most kids really enjoy nurturing plants and watching them grow. But make it easy for them - heavy watering cans and adult-sized tools are difficult for small hands to manage. Get some child-sized tools to keep it fun. You don't even need a garden. You can use old pots, boots, tins or an old rusty wheelbarrow. Just about any container can be painted or decorated, and then planted with masses of flowers or dwarf beans. Whatever pots you choose, I'd recommend annuals for this job, because they usually flower quickly and prolifically. After a few months, when they need to be replaced, you can experiment with something different. Plenty of fun can be had in the garden once the planting is done. Build a fairy house in a secret corner. Use flowers, leaves, twigs, berries ... whatever is on hand. Or build a simple tepee large enough for the kids to sit in. Long, smooth branches or canes cut from something you have growing in the garden will be fine - or grab a packet of tall bamboo stakes. Plant it with climbing beans. It will quickly become a living tent, a great little hideaway, complete with snacks.